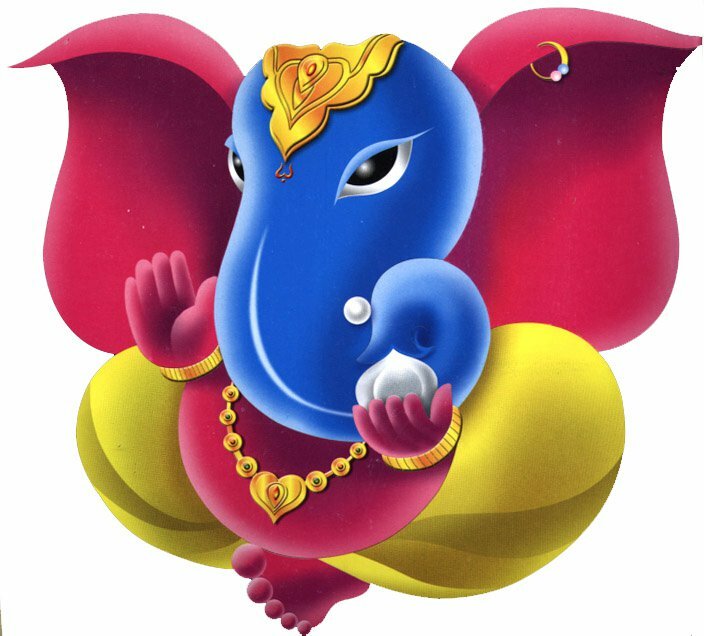 An interesting history associated with Ganesh Chaturthi and its significance. It so happened that all the Gods worshiped Ganesh. Kuber, the wealthiest among the residents of paradise hosts a feast in honor of their new lord. A joyous Ganesh feasts himself to his heart's content. But he grows very restless and feels that his stomach would burst out. In order to prevent the stomach from bursting out, he ties one snake around it and goes to pay obeisance to his parents. But his stomach has now acquired a huge shape. With the tiny stature and a round belly, he is unable to prostrate before his parents. When he tried to bend, he turns into a turtle. The moon watched the scene from the sky and laughed at Ganesh. Parvati detests this ridicule and cursed the moon that whoever sees him on Vinayak Chaturthi will be accused of wrongdoing. According to another version of the story, Ganesh falls down from the rat much to the amusement of the moon, which bursts out laughing and invites Parvati's wrath.The curse was so powerful that even Lord Krishna could not escape from it. He was accused of stealing the Samantak Mani, a very precious gem of Satrajit. The possessor of this stone is said to acquire tremendous prosperity and peace. The story goes like this - Lord Shri Krishna was born and brought up as a cowherd. Once, on the Bhadrapad Chaturthi day, while Krishna was milking his cow, he accidentally catches the reflection of the moon in the vessel. Krishna wonders as to what disaster awaited him and that he may be blamed for a wrongdoing. And indeed, he was accused of stealing the Samantak Mani - worn by Prasen, the brother of Satrajit. Prasen wears the Gem and goes for hunting. In the forest, a lion kills him. A bear called Jambavant watches that attractive red gem lying on Prasen's chest, which he mistakes it for a piece of flesh. He takes the gem to his home. He had a daughter named Jambavati, who is yet a child. Jambavanti, later realizes that the object which he had brought is not a piece of meat. So he ties it over the cradle of his daughter, as a toy. Here in Dwaraka, when Satrajit comes to know of his brother's death, he accuses Krishna of the deed. Satrajit was aware of Krishna's wish to possess the gem. His suspicion is strengthened by this knowledge. However, Krishna tries to convince Satrajit of his innocence, the latter is not to be convinced. To prove his innocence, Krishna goes in search of the Samantaka Mani, in the forest. There he finds the gem hanging on the cradle of a child. Krishna takes it quickly and comes out of the house. Jambavant had a governess to look after his daughter. She screams aloud upon seeing Krishna. Hearing that, Jambavant rushes to the place and challenges Krishna. A war breaks out between the two for 10 days. Jambavant cannot compete with a skilled warrior like Krishna. He gets badly injured and bruised in the battle. At that moment he realized that the enemy is not any ordinary person but Shri Rama, from the Treta Yuga! Lord Krishna returned the precious gem to Satrajit and Jambavant offered his daughter in marriage to Krishna. From then on, to avoid the evil effects of the curse, Parvati declared that the curse will not affect those who worship Lord Ganesha on the Chaturthi day and also listens to this story.